With A Fantastic Design Resembling The Structure Of A Molecule, The Molecular Collection Exhibits Groups Of Atoms Made Of Iridescent Blown Glass. With A Chrome Plated Finish, This Collection Has A Continuous Network Of Tapered Metal Extensions That Seamlessly Connect Each Light In A Sculpture-Like Fashion. Traditional details and graceful lines provide modern elegance to any interior. The Classic three-light chandelier features etched glass shades with a Polished Chrome finish. Glimmer fits the definition of livable luxury with elements that sparkle to create an instant statement within the home. Prismatic glass five-light pendants are supported by an architecturally- styled frame in Polished Chrome finish. The cascade of faceted linear glass deliver a sleek silhouette to any room. Three-light chandelier from the Lucky Collection. The distinctive design evokes a vintage flair with finely crafted details. Light is beautifully illuminated through double prismatic frosted glass shades. Five-light chandelier from the Lucky Collection. The distinctive design evokes a vintage flair with finely crafted details. Light is beautifully illuminated through double prismatic clear glass shades. 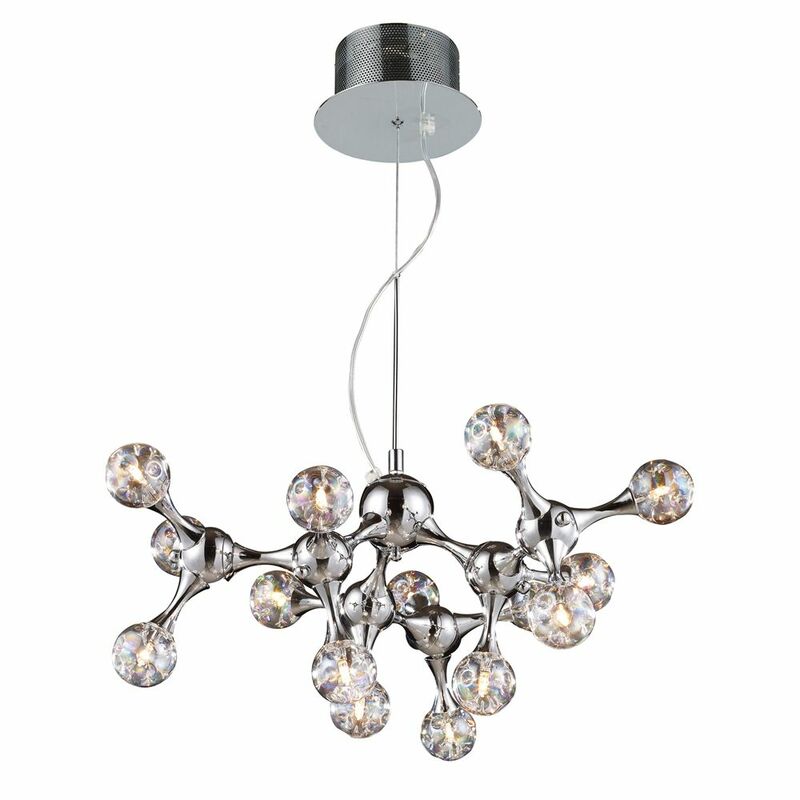 15-Light Ceiling Mount Polished Chrome Chandelier With A Fantastic Design Resembling The Structure Of A Molecule, The Molecular Collection Exhibits Groups Of Atoms Made Of Iridescent Blown Glass. With A Chrome Plated Finish, This Collection Has A Continuous Network Of Tapered Metal Extensions That Seamlessly Connect Each Light In A Sculpture-Like Fashion.